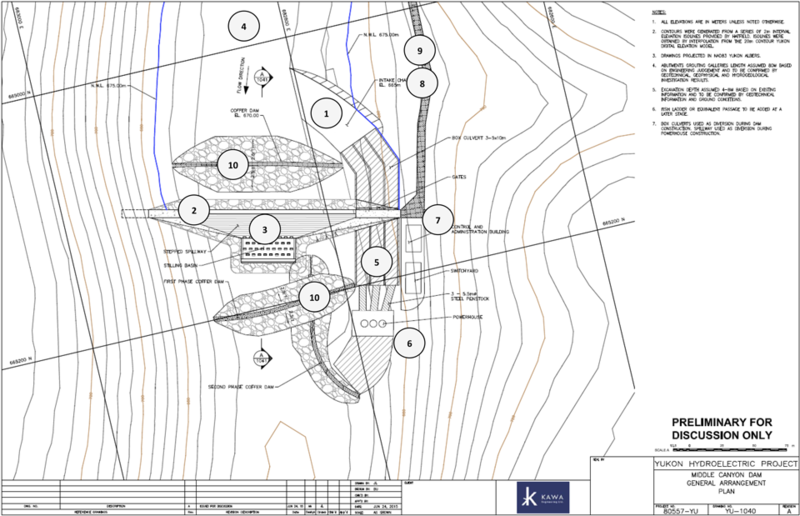 False Canyon project includes an approximately 65 m dam with a spillway control structure, a fish ladder, a water intake, a conveyance, a 3-unit powerhouse, trailrace structures and diversions to facilitate dewatering of the dam site during construction. The Middle Canyon project includes an approximately 17 m dam, fish ladder, a water intake, conveyance, a 3-unit powerhouse, trailrace structure and diversions to facilitate de-watering of the dam site during construction. False Canyon + Middle Canyon Run of River (ROR) is a cascade of two sites with False Canyon located upstream on the Frances River providing both generation and water storage, and Middle Canyon ROR located downstream operating as a ROR facility with no water storage (but a headpond required to create head for generation purposes). 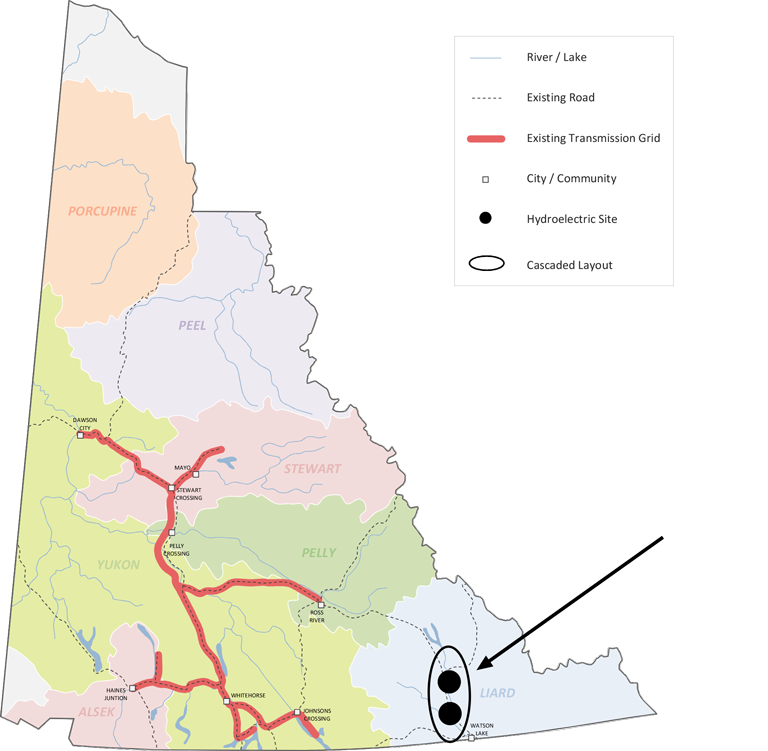 False Canyon is a potential hydroelectric project on the Frances River, located in the Liard River Basin approximately 75 km north of Watson Lake. The total drainage area is estimated at 12,200 km2. The major components of the preliminary project layout are listed in Table 16. 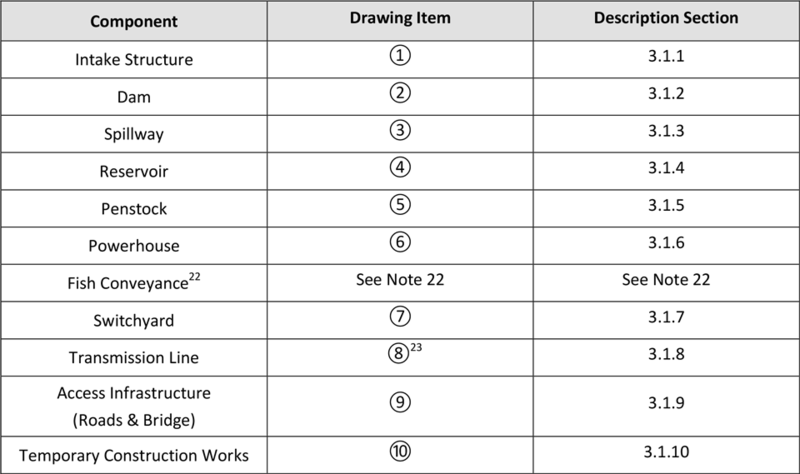 The project components are shown in Figure 8 and described in more detail as per sections listed in Table 16. 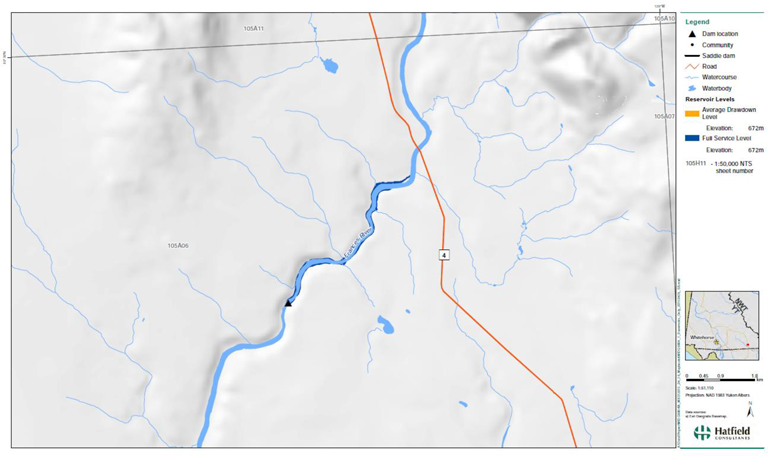 18 At this stage of study, upstream fish passage is expected to be facilitated via fish ladder. During subsequent phases of development, different alternatives may be considered including, but not limited to, mechanical lifts or trap-load-haul operations. 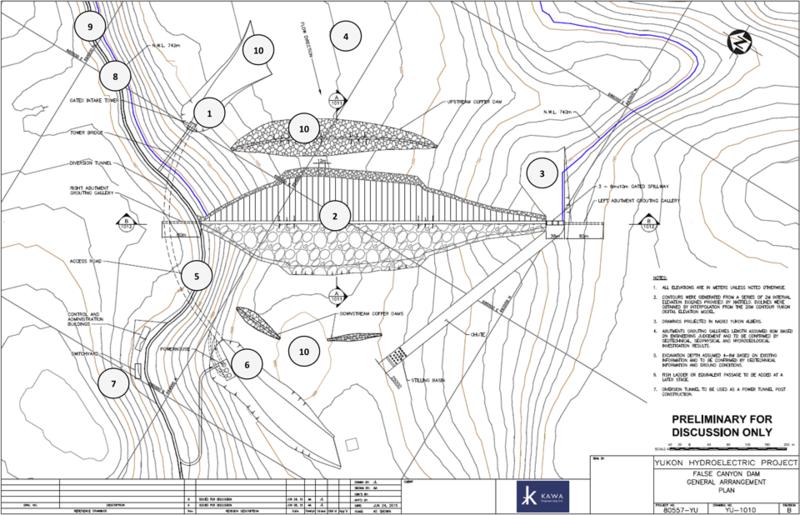 Downstream fish passage is expected to be facilitated through fish friendly turbines (e.g. Kaplan Turbine). 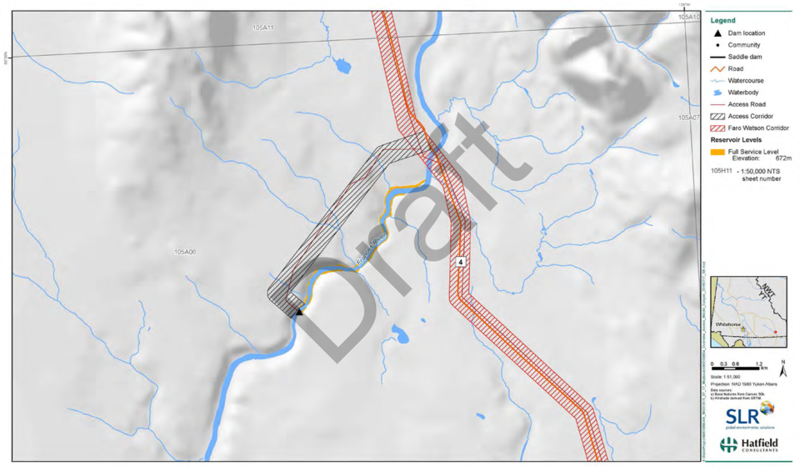 19 The transmission line is not shown on the drawing but is expected to follow approximately the access road from the switchyard to the interconnection point. 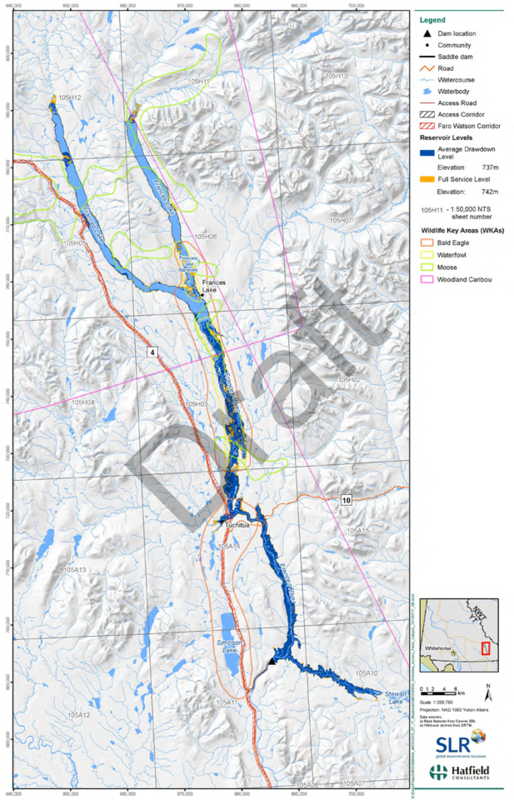 As the downstream project in the cascade, Middle Canyon is a potential ROR hydroelectric project on the Frances River, located in the Liard River Basin approximately 40 km northwest of Watson Lake. The total drainage area is estimated to be 13,000 km2. 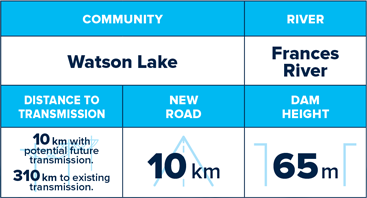 The major components of the preliminary project layout are listed in Table 16. 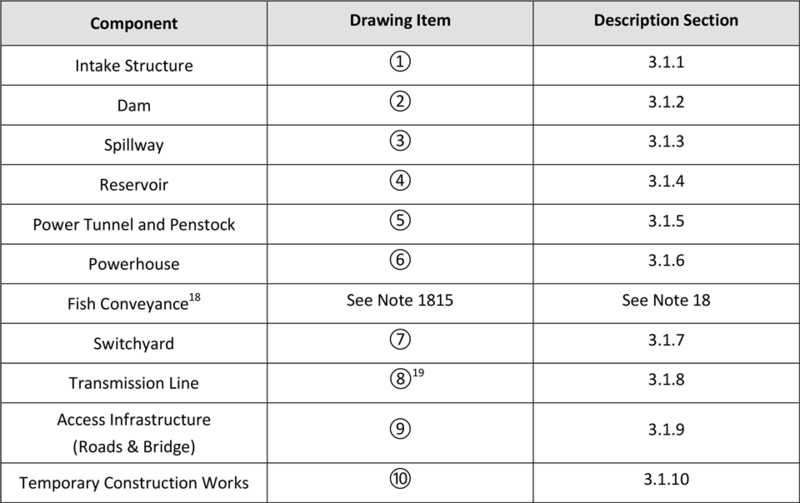 The project components are shown in Figure 8 and described in more detail as per sections listed in Table 16. 22 At this stage of study, upstream fish passage is expected to be facilitated via fish ladder. During subsequent phases of development, different alternatives may be considered including, but not limited to, mechanical lifts or trap-load-haul operations. 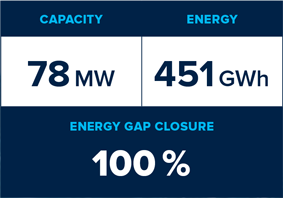 Downstream fish passage is expected to be facilitated through fish friendly turbines (e.g. Kaplan Turbine). 23 The transmission line is not shown on the drawing but is expected to follow approximately the access road from the switchyard to the interconnection point.